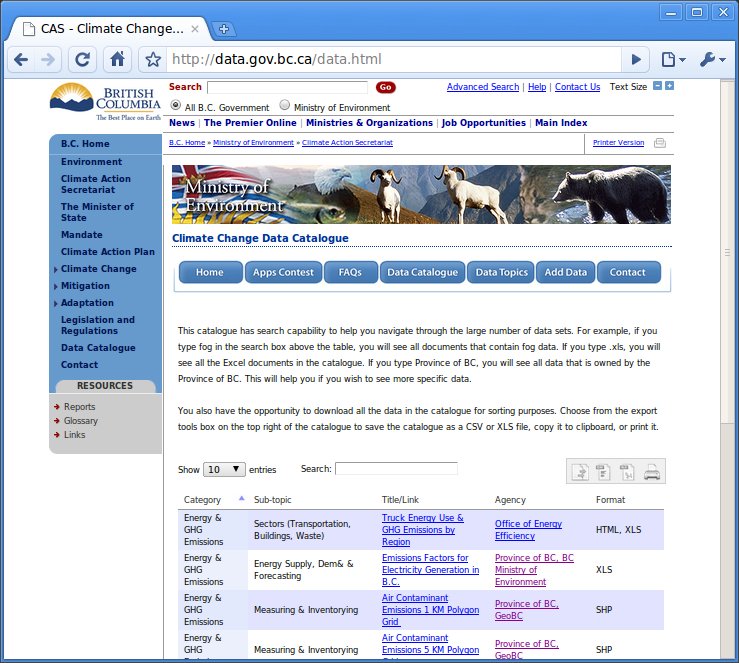 Last week I sat down to have a closer look at the datasets that were released as part of the Province of BC's Apps 4 Climate Action (A4CA) contest. 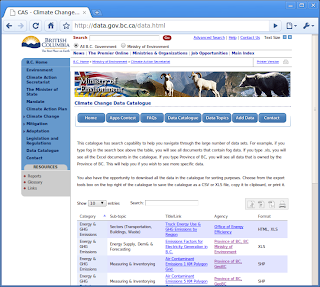 I am very excited about the prospect of open data in BC and wanted to see what was available that might be interesting to use for various projects. The A4CA data listed in the catalogue includes a range of formats and technologies. Some are easier to work with than others. Being able to browse the catalogue online is great but I really want to have a closer look and maybe do some analysis to find the data that is easy to work with. For that I need to download the data so I can work with in it spreadsheet and / or database form. In the perfect world, this data would be available on the site as a downloadable feed, with its own URL so programmers could simply point at the URL and get the data in XML format that goes with it. The A4CA catalog provides a download to .CSV form, which is easy to work with but unfortunately, the link to that data is hidden behind a flash widget, so there is no way to download the data directly. The page itself however does provide the data to the browser in the form of a table. The table shows only 100 records at a time; however, there is another flash widget that allows the user to page through the data 100 records at a time, without a screen refresh. That means the data is already in the browser, all 540 rows of it. It's just a matter of scraping it out using a bit of code. First, checking the robots.txt file for the site (www.gov.bc.ca) file reveals that the site allows for almost any type of program including this one, so that's great. My personal language of choice for this sort of task is Python, which comes pre-installed with all Linux and modern Mac machines and can be easily installed on Windows. In my case I am using Python 2.6 under Ubuntu 9.10. In addition to Python I am using Beautiful Soup which is an excellent library for scraping web sites. Next, we create an object called soup using the BeautifulSoup library. At this point we have the page loaded and we can read whatever parts of it we want using the methods provided by the soup object. I am particularly interested in the table in the middle of the page, that contains the data I am after. Looking at the raw HTML code from inside my browser I see that there is only one table on this page and that it's ID is set to 'example', so that makes it pretty easy to find using the find method provided by the soup object. We also need a place to store our results. I'll use an array for that. Pulling the text out of the table cells is as easy as accessing the .text member. Two of the cells in each row have links, which I wanted to capture as well, so I accessed those by using the .a member and then access the href attribute which is where links are stored in HTML. Now, each row in our records array contains one row from the table with the cell contents and links separated out. This is a good start to making this data more usable for my purposes. Next, I plan to do some data cleaning and then start to do some analysis on it to get a feel for what's available in the A4CA catalogue. With Python and BeautifulSoup it's easy to extract data from a site and I would encourage anyone to give it a try. It's easier than you might think. Now that we have the data in a form we can work with, how do we clean it up and make it more useful? I'll cover that in the next article of this series. I've extracted all of the datasets to http://datadotgc.ca tagged with apps4climateaction. I'm working on a tool to enable people to tag and discover these datasets easier.